The preservation of medical laboratory blood samples, mining of sea water for magnesium, formulation of over-the-counter medicines such as Milk of Magnesia and antacids, and treating the presence of hard water in your home’s water supply are just a few of the many tasks that involve controlling the equilibrium between a slightly soluble ionic solid and an aqueous solution of its ions. dissolution from occurring. Tooth decay, for example, occurs when the calcium hydroxylapatite, which has the formula Ca5(PO4)3(OH), in our teeth dissolves. The dissolution process is aided when bacteria in our mouths feast on the sugars in our diets to produce lactic acid, which reacts with the hydroxide ions in the calcium hydroxylapatite. Preventing the dissolution prevents the decay. On the other hand, sometimes we want a substance to dissolve. We want the calcium carbonate in a chewable antacid to dissolve because the ions produced in this process help soothe an upset stomach. In this section, we will find out how we can control the dissolution of a slightly soluble ionic solid by the application of Le Châtelier’s principle. We will also learn how to use the equilibrium constant of the reaction to determine the concentration of ions present in a solution. This equilibrium, like other equilibria, is dynamic; some of the solid AgCl continues to dissolve, but at the same time, Ag+ and Cl– ions in the solution combine to produce an equal amount of the solid. At equilibrium, the opposing processes have equal rates. Silver chloride is a sparingly soluble ionic solid. When it is added to water, it dissolves slightly and produces a mixture consisting of a very dilute solution of Ag+ and Cl– ions in equilibrium with undissolved silver chloride. When looking at dissolution reactions such as this, the solid is listed as a reactant, whereas the ions are listed as products. The solubility product constant, as with every equilibrium constant expression, is written as the product of the concentrations of each of the ions, raised to the power of their stoichiometric coefficients. Here, the solubility product constant is equal to Ag+ and Cl– when a solution of silver chloride is in equilibrium with undissolved AgCl. There is no denominator representing the reactants in this equilibrium expression since the reactant is a pure solid; therefore [AgCl] does not appear in the expression for Ksp. Some common solubility products are listed in [link] according to their Ksp values, whereas a more extensive compilation of products appears in Appendix J. Each of these equilibrium constants is much smaller than 1 because the compounds listed are only slightly soluble. A small Ksp represents a system in which the equilibrium lies to the left, so that relatively few hydrated ions would be present in a saturated solution. Now we will extend the discussion of Ksp and show how the solubility product constant is determined from the solubility of its ions, as well as how Ksp can be used to determine the molar solubility of a substance. In this case, we calculate the solubility product by taking the solid’s solubility expressed in units of moles per liter (mol/L), known as its molar solubility. The concentration of Ca2+ in a saturated solution of CaF2 is 2.15 10–4M; therefore, that of F– is 4.30 10–4M, that is, twice the concentration of Ca2+. What is the solubility product of fluorite? As with other equilibrium constants, we do not include units with Ksp. Check Your LearningIn a saturated solution that is in contact with solid Mg(OH)2, the concentration of Mg2+ is 1.31 10–4M. What is the solubility product for Mg(OH)2? The Ksp of copper(I) bromide, CuBr, is 6.3 10–9. Calculate the molar solubility of copper bromide. SolutionThe solubility product constant of copper(I) bromide is 6.3 10–9. Therefore, the molar solubility of CuBr is 7.9 10–5M. The Ksp of AgI is 1.5 10–16. Calculate the molar solubility of silver iodide. Determination of Molar Solubility from Ksp, Part IIThe Ksp of calcium hydroxide, Ca(OH)2, is 1.3 10–6. Calculate the molar solubility of calcium hydroxide. SolutionThe solubility product constant of calcium hydroxide is 1.3 10–6. Therefore, the molar solubility of Ca(OH)2 is 1.3 10–2M. The Ksp of PbI2 is 1.4 10–8. Calculate the molar solubility of lead(II) iodide. Note that solubility is not always given as a molar value. When the solubility of a compound is given in some unit other than moles per liter, we must convert the solubility into moles per liter (i.e., molarity) in order to use it in the solubility product constant expression. [link] shows how to perform those unit conversions before determining the solubility product equilibrium. 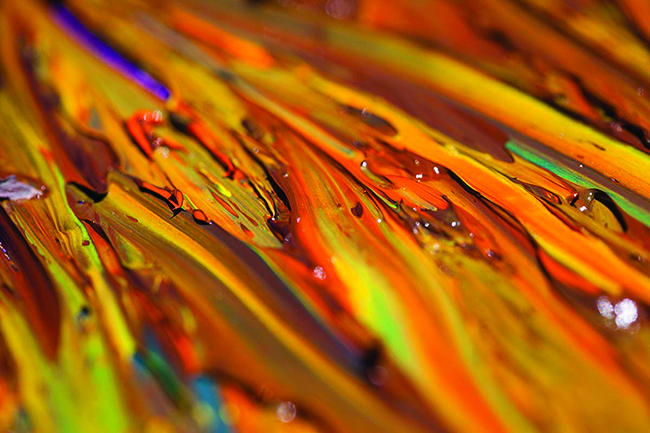 Determination of Ksp from Gram SolubilityMany of the pigments used by artists in oil-based paints ([link]) are sparingly soluble in water. For example, the solubility of the artist’s pigment chrome yellow, PbCrO4, is 4.6 10–6 g/L. Determine the solubility product equilibrium constant for PbCrO4. Check Your LearningThe solubility of TlCl [thallium(I) chloride], an intermediate formed when thallium is being isolated from ores, is 3.46 grams per liter at 20 °C. What is its solubility product? Calculate the molar solubility of Hg2Cl2. Determine the direction of change. Before any Hg2Cl2 dissolves, Q is zero, and the reaction will shift to the right to reach equilibrium. Note that the change in the concentration of Cl– (2x) is twice as large as the change in the concentration of (x) because 2 mol of Cl– forms for each 1 mol of that forms. Hg2Cl2 is a pure solid, so it does not appear in the calculation. The molar solubility of Hg2Cl2 is equal to or 6.5 10–7M. Check Your LearningDetermine the molar solubility of MgF2 from its solubility product: Ksp = 6.4 10–9. Tabulated Ksp values can also be compared to reaction quotients calculated from experimental data to tell whether a solid will precipitate in a reaction under specific conditions: Q equals Ksp at equilibrium; if Q is less than Ksp, the solid will dissolve until Q equals Ksp; if Q is greater than Ksp, precipitation will occur at a given temperature until Q equals Ksp. Various types of medical imaging techniques are used to aid diagnoses of illnesses in a noninvasive manner. One such technique utilizes the ingestion of a barium compound before taking an X-ray image. A suspension of barium sulfate, a chalky powder, is ingested by the patient. Since the Ksp of barium sulfate is 1.1 10–10, very little of it dissolves as it coats the lining of the patient’s intestinal tract. Barium-coated areas of the digestive tract then appear on an X-ray as white, allowing for greater visual detail than a traditional X-ray ([link]). Further diagnostic testing can be done using barium sulfate and fluoroscopy. In fluoroscopy, a continuous X-ray is passed through the body so the doctor can monitor, on a TV or computer screen, the barium sulfate’s movement as it passes through the digestive tract. 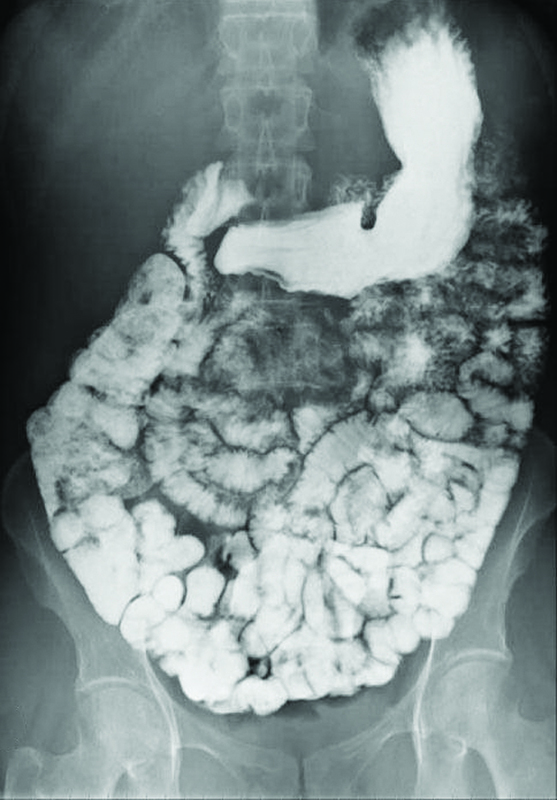 Medical imaging using barium sulfate can be used to diagnose acid reflux disease, Crohn’s disease, and ulcers in addition to other conditions. Visit this website for more information on how barium is used in medical diagnoses and which conditions it is used to diagnose. We can establish this equilibrium either by adding solid calcium carbonate to water or by mixing a solution that contains calcium ions with a solution that contains carbonate ions. If we add calcium carbonate to water, the solid will dissolve until the concentrations are such that the value of the reaction quotient is equal to the solubility product (Ksp = 8.7 10–9). If we mix a solution of calcium nitrate, which contains Ca2+ ions, with a solution of sodium carbonate, which contains ions, the slightly soluble ionic solid CaCO3 will precipitate, provided that the concentrations of Ca2+ and ions are such that Q is greater than Ksp for the mixture. The reaction shifts to the left and the concentrations of the ions are reduced by formation of the solid until the value of Q equals Ksp. A saturated solution in equilibrium with the undissolved solid will result. If the concentrations are such that Q is less than Ksp, then the solution is not saturated and no precipitate will form. The concentration of Mg2+(aq) in sea water is 0.0537 M. Will Mg(OH)2 precipitate when enough Ca(OH)2 is added to give a [OH–] of 0.0010 M? Because Q is greater than Ksp (Q = 5.4 10–8 is larger than Ksp = 8.9 10–12), we can expect the reaction to shift to the left and form solid magnesium hydroxide. Mg(OH)2(s) forms until the concentrations of magnesium ion and hydroxide ion are reduced sufficiently so that the value of Q is equal to Ksp. Use the solubility product in Appendix J to determine whether CaHPO4 will precipitate from a solution with [Ca2+] = 0.0001 M and = 0.001 M.
Does silver chloride precipitate when equal volumes of a 2.0 10–4–M solution of AgNO3 and a 2.0 10–4–M solution of NaCl are mixed? The solubility product is 1.6 10–10 (see Appendix J). Since supersaturated solutions are unstable, AgCl will precipitate from the mixture until the solution returns to equilibrium, with Q equal to Ksp. In the previous two examples, we have seen that Mg(OH)2 or AgCl precipitate when Q is greater than Ksp. In general, when a solution of a soluble salt of the Mm+ ion is mixed with a solution of a soluble salt of the Xn– ion, the solid, MpXq precipitates if the value of Q for the mixture of Mm+ and Xn– is greater than Ksp for MpXq. Thus, if we know the concentration of one of the ions of a slightly soluble ionic solid and the value for the solubility product of the solid, then we can calculate the concentration that the other ion must exceed for precipitation to begin. To simplify the calculation, we will assume that precipitation begins when the reaction quotient becomes equal to the solubility product constant. Blood will not clot if calcium ions are removed from its plasma. 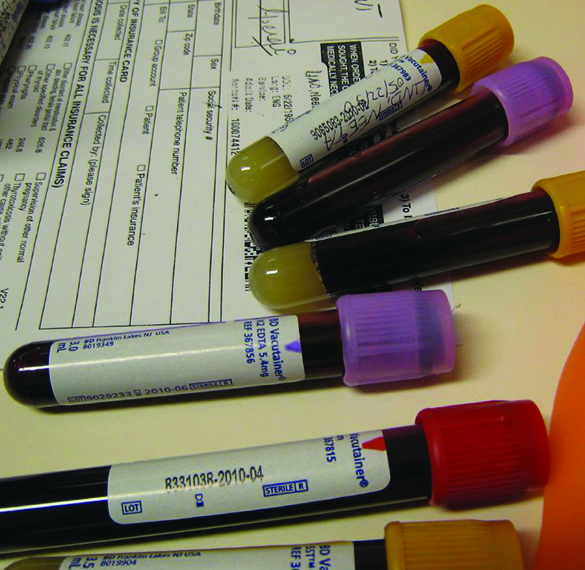 Some blood collection tubes contain salts of the oxalate ion, for this purpose ([link]). At sufficiently high concentrations, the calcium and oxalate ions form solid, CaC2O4·H2O (which also contains water bound in the solid). The concentration of Ca2+ in a sample of blood serum is 2.2 10–3M. What concentration of ion must be established before CaC2O4·H2O begins to precipitate? CaC2O4 does not appear in this expression because it is a solid. Water does not appear because it is the solvent. A concentration of = 8.9 10–6M is necessary to initiate the precipitation of CaC2O4 under these conditions. If a solution contains 0.0020 mol of per liter, what concentration of Ag+ ion must be reached by adding solid AgNO3 before Ag2CrO4 begins to precipitate? Neglect any increase in volume upon adding the solid silver nitrate. It is sometimes useful to know the concentration of an ion that remains in solution after precipitation. We can use the solubility product for this calculation too: If we know the value of Ksp and the concentration of one ion in solution, we can calculate the concentration of the second ion remaining in solution. The calculation is of the same type as that in [link]—calculation of the concentration of a species in an equilibrium mixture from the concentrations of the other species and the equilibrium constant. However, the concentrations are different; we are calculating concentrations after precipitation is complete, rather than at the start of precipitation. Clothing washed in water that has a manganese [Mn2+(aq)] concentration exceeding 0.1 mg/L (1.8 10–6M) may be stained by the manganese upon oxidation, but the amount of Mn2+ in the water can be reduced by adding a base. If a person doing laundry wishes to add a buffer to keep the pH high enough to precipitate the manganese as the hydroxide, Mn(OH)2, what pH is required to keep [Mn2+] equal to 1.8 10–6M? If the person doing laundry adds a base, such as the sodium silicate (Na4SiO4) in some detergents, to the wash water until the pH is raised to 10.52, the manganese ion will be reduced to a concentration of 1.8 10–6M; at that concentration or less, the ion will not stain clothing. The first step in the preparation of magnesium metal is the precipitation of Mg(OH)2 from sea water by the addition of Ca(OH)2. The concentration of Mg2+(aq) in sea water is 5.37 10–2M. Calculate the pH at which [Mg2+] is diminished to 1.0 10–5M by the addition of Ca(OH)2. Due to their light sensitivity, mixtures of silver halides are used in fiber optics for medical lasers, in photochromic eyeglass lenses (glass lenses that automatically darken when exposed to sunlight), and—before the advent of digital photography—in photographic film. Even though AgCl (Ksp = 1.6 10–10), AgBr (Ksp = 5.0 10–13), and AgI (Ksp = 1.5 10–16) are each quite insoluble, we cannot prepare a homogeneous solid mixture of them by adding Ag+ to a solution of Cl–, Br–, and I–; essentially all of the AgI will precipitate before any of the other solid halides form because of its smaller value for Ksp. However, we can prepare a homogeneous mixture of the solids by slowly adding a solution of Cl–, Br–, and I– to a solution of Ag+. When two anions form slightly soluble compounds with the same cation, or when two cations form slightly soluble compounds with the same anion, the less soluble compound (usually, the compound with the smaller Ksp) generally precipitates first when we add a precipitating agent to a solution containing both anions (or both cations). When the Ksp values of the two compounds differ by two orders of magnitude or more (e.g., 10–2 vs. 10–4), almost all of the less soluble compound precipitates before any of the more soluble one does. This is an example of selective precipitation, where a reagent is added to a solution of dissolved ions causing one of the ions to precipitate out before the rest. Solubility equilibria are useful tools in the treatment of wastewater carried out in facilities that may treat the municipal water in your city or town ([link]). 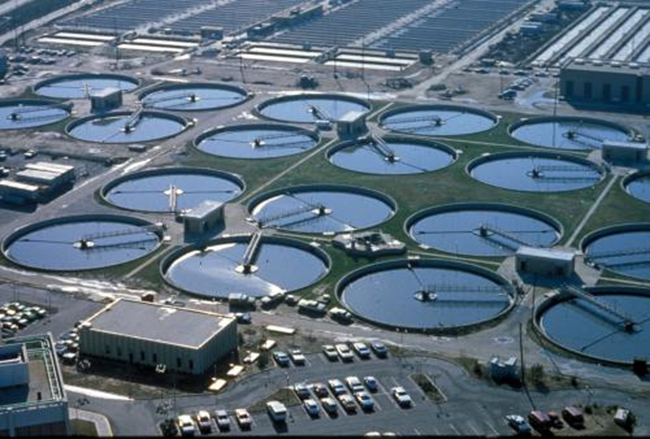 Specifically, selective precipitation is used to remove contaminants from wastewater before it is released back into natural bodies of water. For example, phosphate ions are often present in the water discharged from manufacturing facilities. An abundance of phosphate causes excess algae to grow, which impacts the amount of oxygen available for marine life as well as making water unsuitable for human consumption. The precipitate is then removed by filtration and the water is brought back to a neutral pH by the addition of CO2 in a recarbonation process. Other chemicals can also be used for the removal of phosphates by precipitation, including iron(III) chloride and aluminum sulfate. View this site for more information on how phosphorus is removed from wastewater. Selective precipitation can also be used in qualitative analysis. In this method, reagents are added to an unknown chemical mixture in order to induce precipitation. Certain reagents cause specific ions to precipitate out; therefore, the addition of the reagent can be used to determine whether the ion is present in the solution. A solution contains 0.0010 mol of KI and 0.10 mol of KCl per liter. AgNO3 is gradually added to this solution. Which forms first, solid AgI or solid AgCl? If the solution contained about equal concentrations of Cl– and I–, then the silver salt with the smallest Ksp (AgI) would precipitate first. The concentrations are not equal, however, so we should find the [Ag+] at which AgCl begins to precipitate and the [Ag+] at which AgI begins to precipitate. The salt that forms at the lower [Ag+] precipitates first. AgI begins to precipitate when [Ag+] is 1.5 10–13M. AgCl begins to precipitate when [Ag+] is 1.6 10–9M. AgI begins to precipitate at a lower [Ag+] than AgCl, so AgI begins to precipitate first. If silver nitrate solution is added to a solution which is 0.050 M in both Cl– and Br– ions, at what [Ag+] would precipitation begin, and what would be the formula of the precipitate? Because sodium acetate and acetic acid have the acetate ion in common, the influence on the equilibrium is called the common ion effect. If we were to add potassium iodide (KI) to this solution, we would be adding a substance that shares a common ion with silver iodide. Le Châtelier’s principle tells us that when a change is made to a system at equilibrium, the reaction will shift to counteract that change. In this example, there would be an excess of iodide ions, so the reaction would shift toward the left, causing more silver iodide to precipitate out of solution. View this simulation to see how the common ion effect work with different concentrations of salts. Calculate the molar solubility of cadmium sulfide (CdS) in a 0.010-M solution of cadmium bromide (CdBr2). The Ksp of CdS is 1.0 10–28. Therefore, the molar solubility of CdS in this solution is 1.0 10–26M. Calculate the molar solubility of aluminum hydroxide, Al(OH)3, in a 0.015-M solution of aluminum nitrate, Al(NO3)3. The Ksp of Al(OH)3 is 2 10–32. The solubility product of a slightly soluble electrolyte can be calculated from its solubility; conversely, its solubility can be calculated from its Ksp, provided the only significant reaction that occurs when the solid dissolves is the formation of its ions. A slightly soluble electrolyte begins to precipitate when the magnitude of the reaction quotient for the dissolution reaction exceeds the magnitude of the solubility product. Precipitation continues until the reaction quotient equals the solubility product. A reagent can be added to a solution of ions to allow one ion to selectively precipitate out of solution. The common ion effect can also play a role in precipitation reactions. In the presence of an ion in common with one of the ions in the solution, Le Châtelier’s principle applies and more precipitate comes out of solution so that the molar solubility is reduced. How do the concentrations of Ag+ and in a saturated solution above 1.0 g of solid Ag2CrO4 change when 100 g of solid Ag2CrO4 is added to the system? Explain. There is no change. A solid has an activity of 1 whether there is a little or a lot. How do the concentrations of Pb2+ and S2– change when K2S is added to a saturated solution of PbS? What additional information do we need to answer the following question: How is the equilibrium of solid silver bromide with a saturated solution of its ions affected when the temperature is raised? The solubility of silver bromide at the new temperature must be known. Normally the solubility increases and some of the solid silver bromide will dissolve. Which of the following slightly soluble compounds has a solubility greater than that calculated from its solubility product because of hydrolysis of the anion present: CoSO3, CuI, PbCO3, PbCl2, Tl2S, KClO4? Which of the following slightly soluble compounds has a solubility greater than that calculated from its solubility product because of hydrolysis of the anion present: AgCl, BaSO4, CaF2, Hg2I2, MnCO3, ZnS, PbS? The Handbook of Chemistry and Physics gives solubilities of the following compounds in grams per 100 mL of water. Because these compounds are only slightly soluble, assume that the volume does not change on dissolution and calculate the solubility product for each. Use solubility products and predict which of the following salts is the most soluble, in terms of moles per liter, in pure water: CaF2, Hg2Cl2, PbI2, or Sn(OH)2. Assuming that no equilibria other than dissolution are involved, calculate the concentration of all solute species in each of the following solutions of salts in contact with a solution containing a common ion. Show that changes in the initial concentrations of the common ions can be neglected. This value is less than 5% and can be ignored. Check: the condition is satisfied. x is less than 5% of [OH–] and is, therefore, negligible. Assuming that no equilibria other than dissolution are involved, calculate the concentration of all solute species in each of the following solutions of salts in contact with a solution containing a common ion. Show that it is not appropriate to neglect the changes in the initial concentrations of the common ions. Therefore, the condition is satisfied. The condition is satisfied; the above value is less than 5%. This value is greater than 5%, so a more exact method, such as successive approximations, must be used. Explain why the changes in concentrations of the common ions in [link] can be neglected. Explain why the changes in concentrations of the common ions in [link] cannot be neglected. The changes in concentration are greater than 5% and thus exceed the maximum value for disregarding the change. Calculate the solubility of aluminum hydroxide, Al(OH)3, in a solution buffered at pH 11.00. Refer to Appendix J for solubility products for calcium salts. Determine which of the calcium salts listed is most soluble in moles per liter and which is most soluble in grams per liter. CaSO4∙2H2O is the most soluble Ca salt in mol/L, and it is also the most soluble Ca salt in g/L. Most barium compounds are very poisonous; however, barium sulfate is often administered internally as an aid in the X-ray examination of the lower intestinal tract ([link]). This use of BaSO4 is possible because of its low solubility. Calculate the molar solubility of BaSO4 and the mass of barium present in 1.00 L of water saturated with BaSO4. Public Health Service standards for drinking water set a maximum of 250 mg/L (2.60 10–3M) of because of its cathartic action (it is a laxative). Does natural water that is saturated with CaSO4 (“gyp” water) as a result or passing through soil containing gypsum, CaSO4·2H2O, meet these standards? What is in such water? 4.8 10–3M = = [Ca2+]; Since this concentration is higher than 2.60 10–3M, “gyp” water does not meet the standards. (a) Calculate [Ag+] in a saturated aqueous solution of AgBr. (b) What will [Ag+] be when enough KBr has been added to make [Br–] = 0.050 M? (c) What will [Br–] be when enough AgNO3 has been added to make [Ag+] = 0.020 M? Assuming that no equilibria other than dissolution are involved, calculate the concentrations of ions in a saturated solution of each of the following (see Appendix J for solubility products). (a) [Ag+] = [I–] = 1.3 10–5M; (b) [Ag+] = 2.88 10–2M, = 1.44 10–2M; (c) [Mn2+] = 3.7 10–5M, [OH–] = 7.4 10–5M; (d) [Sr2+] = 4.3 10–2M, [OH–] = 8.6 10–2M; (e) [Mg2+] = 1.3 10–4M, [OH–] = 2.6 10–4M. (b) The compound does not precipitate. (c) The compound does not precipitate. Calculate the concentration of when Ag3PO4 starts to precipitate from a solution that is 0.0125 M in Ag+. What [Ag+] is required to reduce to 8.2 10–4M by precipitation of Ag2CO3? What [F–] is required to reduce [Ca2+] to 1.0 10–4M by precipitation of CaF2? A volume of 0.800 L of a 2 10–4–M Ba(NO3)2 solution is added to 0.200 L of 5 10–4M Li2SO4. Does BaSO4 precipitate? Explain your answer. Perform these calculations for nickel(II) carbonate. (a) With what volume of water must a precipitate containing NiCO3 be washed to dissolve 0.100 g of this compound? Assume that the wash water becomes saturated with NiCO3 (Ksp = 1.36 10–7). (b) If the NiCO3 were a contaminant in a sample of CoCO3 (Ksp = 1.0 10–12), what mass of CoCO3 would have been lost? Keep in mind that both NiCO3 and CoCO3 dissolve in the same solution. Iron concentrations greater than 5.4 10–6M in water used for laundry purposes can cause staining. What [OH–] is required to reduce [Fe2+] to this level by precipitation of Fe(OH)2? (b) and Cl–: Add Ba2+. (c) Hg2+ and Co2+: Add S2–. (d) Zn2+ and Sr2+: Add OH– until [OH–] = 0.050 M.
(f) and OH–: Add Ba2+. A solution contains 1.0 10–5 mol of KBr and 0.10 mol of KCl per liter. AgNO3 is gradually added to this solution. Which forms first, solid AgBr or solid AgCl? A solution contains 1.0 10–2 mol of KI and 0.10 mol of KCl per liter. AgNO3 is gradually added to this solution. Which forms first, solid AgI or solid AgCl? About 50% of urinary calculi (kidney stones) consist of calcium phosphate, Ca3(PO4)2. The normal mid range calcium content excreted in the urine is 0.10 g of Ca2+ per day. The normal mid range amount of urine passed may be taken as 1.4 L per day. What is the maximum concentration of phosphate ion that urine can contain before a calculus begins to form? Sea water has a density of 1.026 g/cm3 and contains 1272 parts per million of magnesium as Mg2+(aq) by mass. What mass, in kilograms, of Ca(OH)2 is required to precipitate 99.9% of the magnesium in 1.00 103 L of sea water? (a) The iodate ion concentration of a saturated solution of La(IO3)3 was found to be 3.1 10–3 mol/L. Find the Ksp. (b) Find the concentration of iodate ions in a saturated solution of Cu(IO3)2 (Ksp = 7.4 10–8). Calculate the molar solubility of AgBr in 0.035 M NaBr (Ksp = 5 10–13). How many grams of Pb(OH)2 will dissolve in 500 mL of a 0.050-M PbCl2 solution (Ksp = 1.2 10–15)? Use the simulation from the earlier Link to Learning to complete the following exercise:. Using 0.01 g CaF2, give the Ksp values found in a 0.2-M solution of each of the salts. Discuss why the values change as you change soluble salts. Two hypothetical salts, LM2 and LQ, have the same molar solubility in H2O. If Ksp for LM2 is 3.20 10–5, what is the Ksp value for LQ? Which of the following carbonates will form first? Which of the following will form last? Explain. MnCO3 will form first, since it has the smallest Ksp value it is the least soluble. MnCO3 will be the last to precipitate, it has the largest Ksp value. How many grams of Zn(CN)2(s) (117.44 g/mol) would be soluble in 100 mL of H2O? Include the balanced reaction and the expression for Ksp in your answer. The Ksp value for Zn(CN)2(s) is 3.0 10–16. Precipitation and Dissolution by OpenStaxCollege is licensed under a Creative Commons Attribution 4.0 International License, except where otherwise noted.